Happy Friday friends! 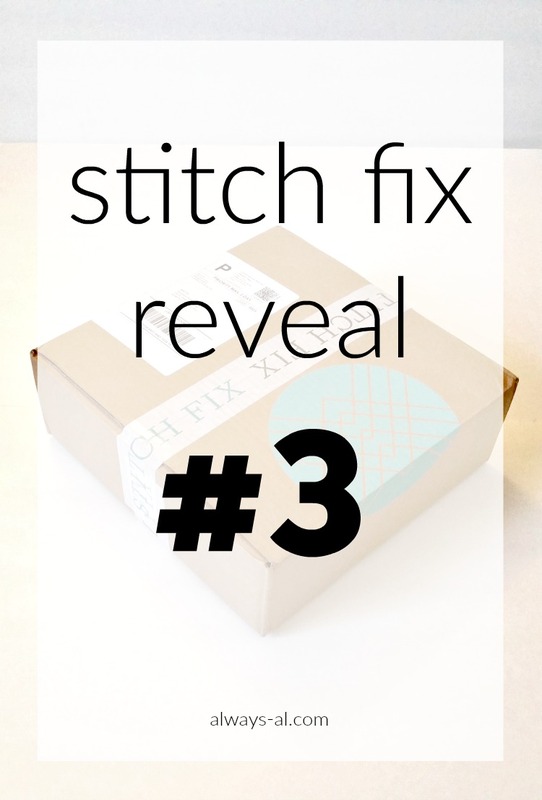 I was so excited to receive my Stitch Fix box this month! I decided to make this an every-other month service, but I feel like this just makes my excitement for the boxes to come increase. I am not someone who loves to spend hours shopping at the mall, so having my own wardrobe stylist and personal shopper is a huge treat for me. For this box, I asked my stylist (Lindsay from Indiana) for Fall basics that could be layered. I think that she did a great job giving me what I wanted. When I first opened up the box, I was a little bit scared...because I really liked everything, and it's not in my budget to keep everything. But after trying all of the clothes on and thinking about it for a few days, my normal picky self kicked in. I tell you, Lindsay is a saint for dealing with me. Here's what I got, what I kept, and what I returned! I mentioned to my stylist that I might want some pixi pants, and she sent these pretty pants along. Unfortunately they were a little long for a pixi pant on me, and the waist was a little large. I loved the material though, and they seemed like they would be great work pants. 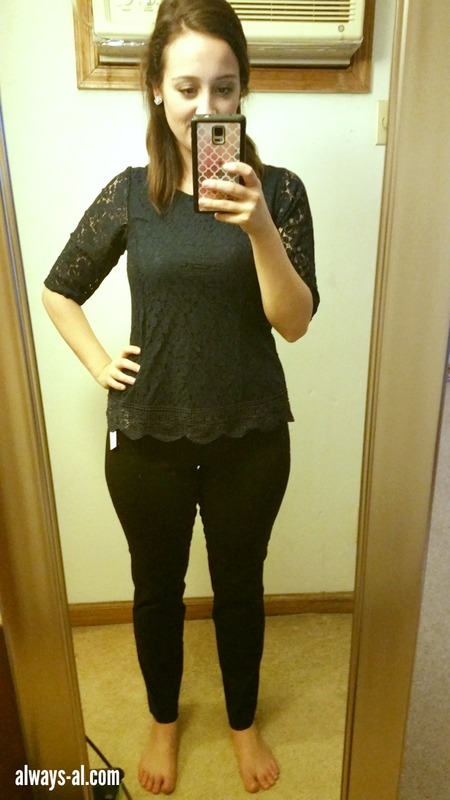 This lace overlay top was a beautiful navy color, and it looked great on. I loved the length of the sleeve too. What I didn't love was that the overlay didn't continue to the back, and I felt like the top was a little bit expensive for a top of that quality. When I first opened my box, I thought I was going to keep this. I love sweaters with elbow patches, and think they are a great mix of trendy and classic. However once I put it on, the material just felt very thin and kind of itchy. I didn't love it, so back it went. This top is such a gorgeous shade of emerald green. 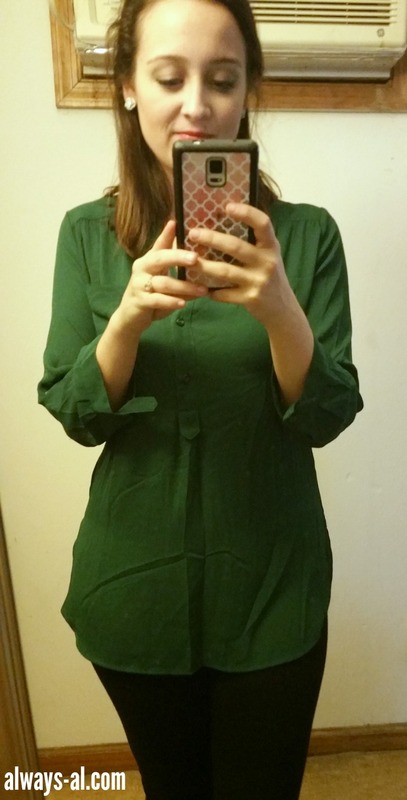 I don't really have anything like it in my closet, and it is such a good color for fall. 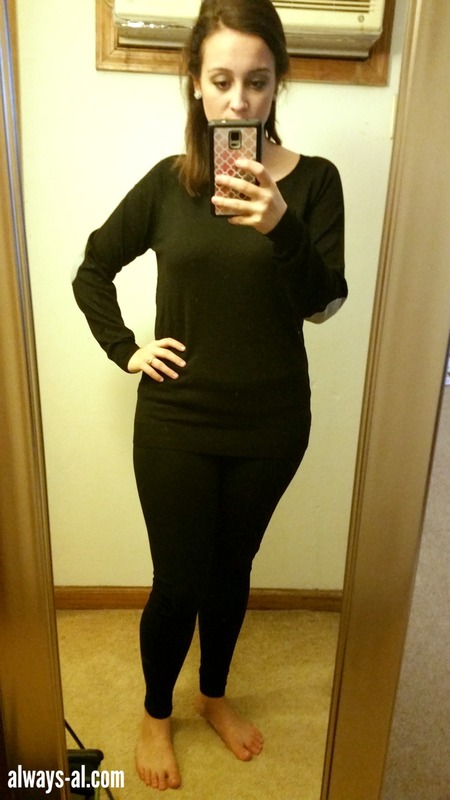 I actually wore this to work on Monday with some black pants, brown boots and a blanket scarf. It was the epitome of basic, and I loved every minute. This is another piece that when I opened the box, I thought I would keep it. I saw on my packet that it had faux leather, and normally I wouldn't be bothered by that, but this edging was very plastic-y. I can't see it holding up well in the wash, and I didn't want to waste my money. It's unfortunate, because I really like the cardigan itself. 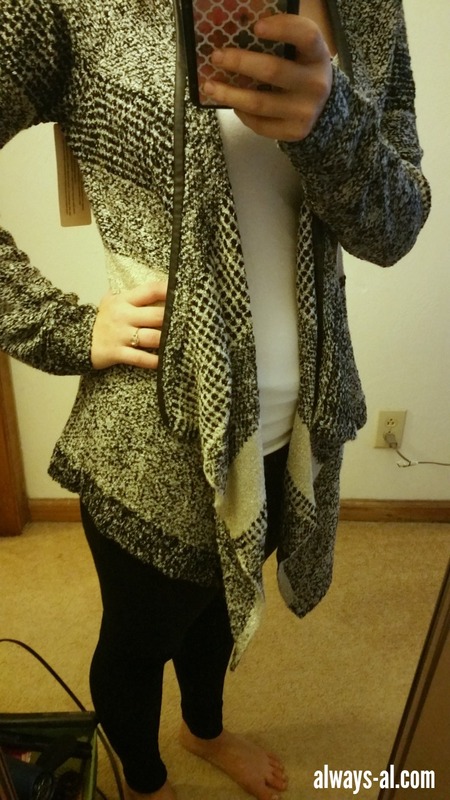 Are you interested in joining me in Stitch Fix? 1. Start by heading to Stitchfix.com and entering your style profile. This helps your stylist get to know you as well as mine did! You answer questions about your sizing, pricing preferences, what you are looking for and what you are not looking for. Also make sure to keep up your Pinterest board so your stylist can check out what you like! 2. Order your fix! When you order each fix, you get charged a $20 styling fee. But, if you purchase an item, and you probably will because you will like the stuff, that $20 will be credited towards your purchase. In your fix you can receive clothing, jewelry and accessories, which your stylist will select based on your style profile. You have the choice to schedule fixes when you choose... you aren't obligated to buy one every month. 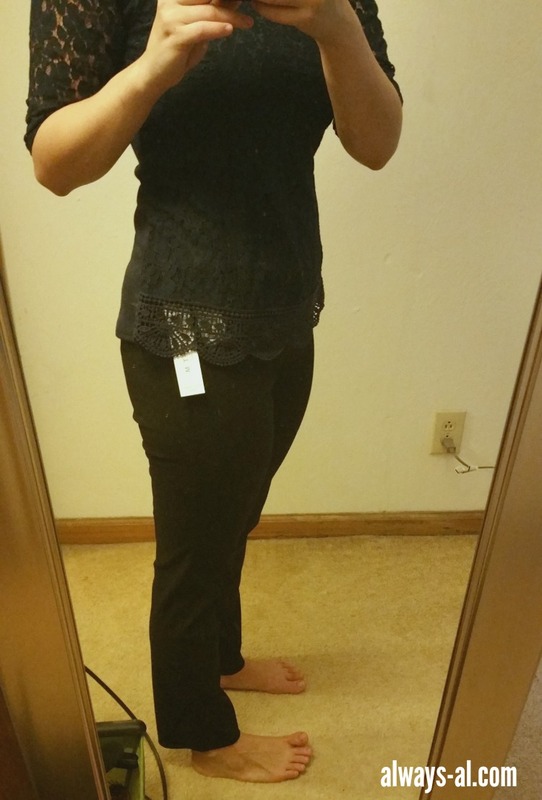 This is one of the main reasons I personally chose Stitch Fix. 3. Once you have your fix, and have tried it on (and probably taken photos), you need to decide what you are going to keep, and what you are going to send back. You have three business days to decide, before you then go online, fill out your follow up survey, and then send anything back that you don't want in a postage paid bag. Check out what I received in my past fixes! Did I make the right decision? Should I have kept the elbow patch sweater, or the lace overlay top? Am I being too picky?